Located in Long Island, this restaurant has had some good press, and was mentioned in Time Out magazine as the Best Cheap Burgers in NYC. Well, if you are really concerned about maximum return of investment, $US 4.70 (£3) gives you an amazing burger in The Burger Garage. In case you’re into hot dogs, they have some fantastic flavours. The Burger Garage is located in an old industrial garage dating back to the 1950’s and has a garage themed interior with old tyres on the walls. Off-beat and spacious, it is run by the Pileski brothers. Location? The Burger Garage, 25-36 Jackson Avenue, Long Island City, NY 11101. Opening times: Monday – Saturday 11:30 am – 10:00 pm. Closed Sunday. Price level (only burger): Single 4oz $ 4.70( £3.00), Single 4oz Cheeseburger $5.20(3.30), Double 8oz $6.95 (£4.50). Price level (burger+chips & drink): “THE B.G. BURGER” is only $8.70 (£5.60). 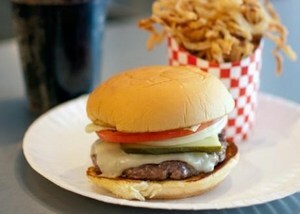 The B.G burgers are served with American Cheese, Lettuce, Tomato, Onion, Pickle & The B.G. Sauce. They only use the finest and freshest ingredients, like 100% USDA Certified Black Angus beef, with no hormones or antibiotics. They also use Grade 1 Idaho Russets potatoes, which are hand cut. The Spark Plug Hot Dog + Fries Served w/ Ketchup, Mustard, Onions & Relish. How long do you have to wait to be seated and to get food? Quite a fast turnover. Usually, you get a table within 5-15 minutes. They are one of the few restaurants that serve Gluten Free Burgers & Hot Dog Buns. Yes, The Burger Garage offers delivery and you can also order online. Any alternative burger restaurants in New York? Whitmans burgers are priced about the same and are also worth a visit. If you want to experience a classic place, try Shake Shack burgers.